This week my mom came to visit for the first time since my dad passed. I looked forward to spending a couple of days with her and the only commitment I had was to host a Facebook Live event on Friday for the Hay House publishing page. I had purchased new equipment for the session and wanted to set it up early in the day so I’d be ready to enjoy a stress-free, successful video experience. As mom and I chatted over tea, I unpacked a new tripod, extended and secured the legs, and screwed in the adaptor that would hold my iPhone. Then I went in search of the best, light-filled spot in my office to record. Doing Facebook Live events is a new experience and when learning anything new, it’s often a mixed blessing. While I love the idea of connecting with my community in real time to offer support and coaching (something I intend to do more of), the reality is it’s stressful. Facebook Live is like doing live television without the benefit of having any delay. When you’re on, you’re on, so you have to cross your fingers and hope for the best. Remnants of a green drink still in your teeth? Hair flying this way and that? Cat popping up on your lap during an important conversation? Everyone will see it and there’s nothing you can do about it once you’re in motion. As a result, when it comes time to hit “GO LIVE” on my iPhone, I’m usually sitting with a swarm of butterflies in my stomach. So, fifteen minutes before noon on Friday, I sat down in the spot I set up earlier and prepared to begin. I put a glass of water on a table next to me, grabbed a pad of paper and a pen, and reached up to slide my iPhone into the new adaptor at the top of the tripod. That’s when the adapter snapped in half and my iPhone fell to the floor. I looked up at the tripod in disbelief, realizing that it had now been rendered unusable. I stood up, uttered a few curse words (sorry mom) and ran around the house trying to find a new place to host my iPhone and me. I tried stacking books on the kitchen counter. Then I moved them to the dining room table. I pulled a shade off a nearby lamp and placed it next to me only to discover that the lighting didn’t work and you could barely see my face. You should have tested the equipment beforehand. Now you’re going to be self-conscious and stressed during the session. That’s when I remembered something I learned from Deepak Chopra twenty years ago: Stretch time. I went to sit in the original chair I had set up in my office. I closed my eyes and took several deep breaths. I allowed my body to relax and my mind to become calm. Then I imagined time slowing down, welcoming me into the present moment. Why not make this Facebook Live experience fun? And that did it. I was off and running. I picked up my phone, held it in front of my face, smiled into the camera, and hit GO LIVE. Instead of worrying about how I looked or whether I was able to hold the camera still, I focused on the topic I love and know to be so important: extreme self-care. I put my attention where it belonged, on delivering helpful information about a course that is near and dear to my heart, a course that’s been years in the making. The idea of turning a stressful situation into something fun by simply making a choice, is a new one for me and I intend to use this strategy when I’m feeling stressed or overwhelmed from now on. That’s called good self-care . 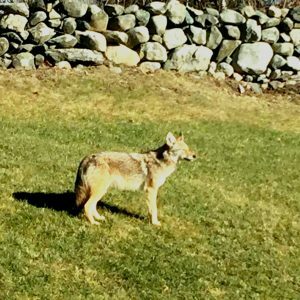 What’s the message of Coyote? If you’d like to join me for a year of self-care that will help you transform your life (for less than $25 dollars a month), please check out the course info here. The early bird price ends on Monday at midnight so be sure to take advantage of the discount. Here’s a video that explains why I get my signs and confirmations from nature. You can watch it here.